As part of renovation works at the football stadium in Veracruz an unusual gate was built, resembling shark’s mouth. 10-meter tall structure is associated with local team called Tiburones Rojos (Red Sharks). Tiburones Rojos of southern Veracruz agglomeration returned to the top flight of Mexico after five years of absence. The promotion coincided with renovation plan being implemented ahead of the 2014 Central American and Caribbean Games that are to be held in Veracruz. 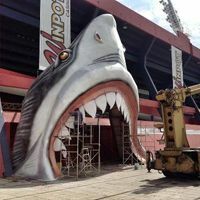 The football stadium of ‘Red Sharks’ is to be facelifted for some 150 million pesos (€8.5m / $11.5m) for the tournament, but what one might not expect to be part of the works is a huge shark’s mouth welcoming fans at Gate 1 of 45-year-old Estadio Luís de la Fuente. The structure is 10-meter tall and weighs 2 tons, making quite an impression as fans wandered through it for the first time last week. Sculptor Juan Manuel Vizcaíno working on the structure informed MunicipiosSur.com website that altogether 5 of such sharks are to be installed in front of entry gates to Estadio ‘Pirata’ Fuente.